Today’s Practitioner is dedicated to serving the growing integrative medical community with relevant and timely evidence-based information to make your medical practice thrive. Their team understand that healthcare is about both health and wellness, which is why we strive to provide information on preventive measures, disease treatments and ways to improve your patient’s quality of life. 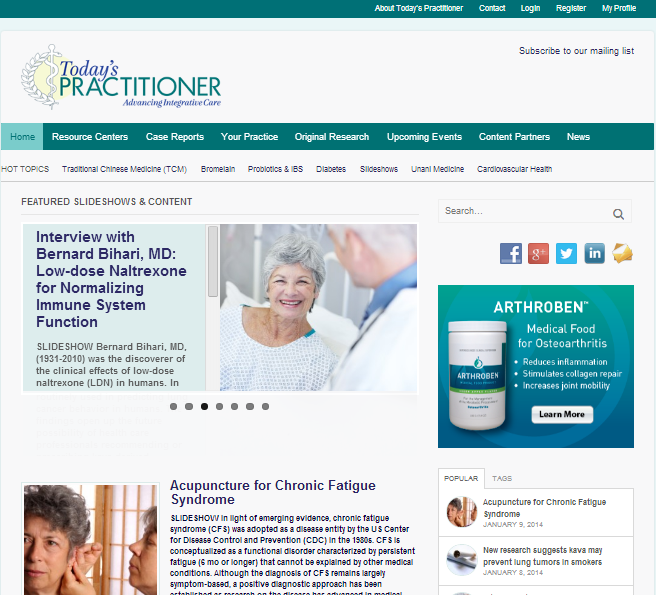 Today’s Practitioner is also an information resource for the latest information on medical devices, dietary supplements, pharmaceuticals and related practice management resources for the integrative-care practitioner. Today’s Practitioner’s content partners include Alternative Therapies, Integrative Medicine a Clinician’s Journal, Age Management Medicine Group, Advances in Mind Body Medicine, Assoc. for the Advancement of Restorative Medicine, and others.